Fuji X-T1 vs. X-E2 vs. X-Pro1, a detailed comparison. Fujifilm’s X-T1 is a different calibre of mirrorless camera. However, there are areas in which its older siblings, the X-E2 and X-Pro1, can still better it. More than a few people have a special place in their heart for what the X-Pro1, in particular, offers. Some are real advantages, others are less rational, almost nostalgic ties. All reasons are undeniably valid. Personally, I can look past the romance, and stick to function. Some days I have to work at it, but most of the time it’s easy. Some people also like working around a camera’s “quirks.” I am not one of them. Quirks—especially those that can be easily remedied—frustrate me for the most part. To cut to the chase, the X-T1 is simply the best overall camera of the three. It’s faster, handles better, and it gets out of your way the most. So why might someone opt for the X-E2 or even the granddaddy of interchangeable X-Series cameras, the X-Pro1? Let’s find out. If you’d like to purchase one of these cameras, or anything else for that matter, please consider using one of the affiliate links below. The price is the same for you, but a small percentage of the purchase price goes to me, which helps keep this site going. Thank you. P Mode: 1/4 to 1/4000 sec. Time: 1/2 to 30 sec. Synchronized shutter speed for flash : 1/180 sec. or slower P Mode: 1/4 to 1/4000 sec. 0.005 seconds 0.005 seconds ??? Auto, Forced Flash, Suppressed Flash, Slow Synchro, Rear-curtain Synchro. Red-eye Reduction Auto, Red-eye Reduction & Forced Flash, Suppressed Flash, Red-eye Reduction & Slow Synchro, Red-eye Reduction & Rear-curtain Synchro. This is barely a contest. The X-T1 wins without even trying. From the EVF to autofocus speed to AF tracking, there really is no aspect in terms of performance that the X-T1 loses at. Now before anyone gets up in arms, “Performance” and “Handling” are two very different things in my view. The first is measurable and provable with no room for argument. The latter can have opinions weaved throughout it. I’ll temper mine slightly. X-E2 FIRMWARE 2.00+ UPDATE: The X-E2 firmware version 2.00 promised to deliver EVF refresh rates comparable to the X-T1. Having installed the update, and tested the EVF’s refresh rate before and after installation compared to the X-T1, my opinion is that that the EVF performace has increased noticeably in the X-E2, and is very close, if not at par with the X-T1. In fact, the EVF panel in the X-T1 is actually of the same hardware specification as the one found in the X-E2. An easy way to see for yourself—assuming you have both cameras at your side of course—is to point the camera at an extremely lowlit area, look around that area, and then quickly pan to an area that is more brightly lit. This will bring any framerate slowdowns to the forefront. 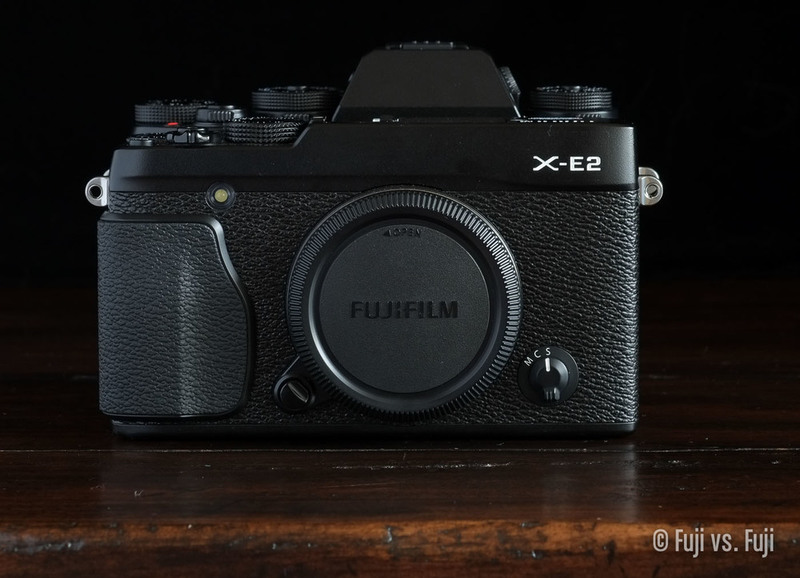 X-E2 owners can take a great deal of satisfaction out of knowing their EVF has been drastically improved. This is just one reason I love these cameras. One item of interest I noticed in the stress test above is more of a slowdown using both cameras with the 35mm f/1.4 than with the 23mm f/1.4. The EVFs on both cameras drop more frames with the 35mm f/1.4 attached. That might just be the gamer in me coming out though. In the comparison photos above, the difference in size might be less apparent than in person. On its own, the X-Pro1 doesn’t seem like a large camera, but sitting here beside me, the difference is very obvious. The X-T1 is also different enough in size next to the X-E2 to be a point of consideration when choosing which to buy. The added EVF hump and thickness of the grip lead to an camera that will take up more room in a smaller camera bag. That’s not to say it’s large by any means. Seeing the X-T1 on its own is actually misleading. The “small” Nikon Df for instance, absolutely dwarfs the X-T1. As for weight, considering the difference in size, the added weight of the X-Pro1 over the X-T1 is a negligible 7.5g. The X-E2 on comes in a full 100g lighter than the X-Pro1 though. This is where things get subjective, but there are some ways in which each camera has advantages over one or both of the others. The X-T1 has more physical dials and switches that make more functions immediately accessible without button presses or wading through menus. In that sense, it wins. As mentioned in my X-T1 review, some of the buttons are not terribly satisfying to use, and one thing immediately comes to mind. There are reports of D-pads being fixed while cameras are in the shop to service the light leak issue. I actually noted my mushy D-pad on the service order, and it was addressed as having “no fault.” I’m not sure if there are worse ones out there, or if I just got unlucky with which technician handled my camera. There are also reports that the second round of manufacturing has delivered cameras with better D-pads. Perhaps it has, but I personally have not handled one yet. EDIT: Since publishing this article, I’ve handled many X-T1’s now, and the D-pads are all unmistakably better. If you are in the market for an X-T1 today, provided it is from the second round of manufacturing, you should find yourself with an X-T1 with a perfectly usable Directional pad. This a great news for everyone, but us early adopters. It may also come into play for those in the market for a used X-T1. Despite the hardware improvement, the X-E2 and X-Pro1 still have superior D-pads. The X-E2’s D-pad is a little smaller, and the plastic build of the camera becomes obvious with button presses. The X-Pro1’s D-pad buttons are larger have a more quality “click” to them because of its sturdier build. With that said, I’ll move on to another matter entirely; D-pad placement. When I mount a heavy lens like the 10-24mm f/4 (review), and bend my wrist towards me to check my aperture, I almost always inadvertently mash the bottom of the D-pad with the bottom of my hand, near the thumb. This is frustrating. A grip might help here, but I’m reviewing these cameras as they come out of the box. This problem does not exist with the X-T1, and is why the D-pad is so recessed. It doesn’t happen on the X-E2 for me either, and because of that, I have to hand the D-pad crown to the X-E2 (or X-E1). The X-T1 has four commands or settings that are more quickly accessible than the X-E2, and five more than the X-Pro1 before you start accounting for Fn buttons. They are, ISO, Drive, Metering, Video Recording, and both the X-T1 and X-E2 have separate AE-L and AF-L buttons. I like that the Drive and metering modes are readily visible without accessing menus. The ISO dial is helpful too. The only trouble is if you’re the sort of person who owns more than one Fujifilm camera, going back and forth could almost negate the benefit of having these extra dials because of the added cognitive effort in determining which camera you’re currently holding. For single-camera owners (or dual X-T1 owners), the X-T1 is all win here. For the rest of us, hopefully things will be brought back into line when the next revisions of Fujifilm’s other cameras are released. The X-T1 and X-E2 both offer exposure compensation dials that can be set to ±3EV rather than the ±2EV of the X-Pro1. The X-T1’s exposure compensation dial is definitely the nicest to use. It’s larger and can be grasped between your thumb and forefinger. The X-T1 and X-Pro1 share a similar shutter speed dial, however the X-T1 adds the same “180x” setting for maximum flash syncing that is also found on the smaller shutter speed dial of the X-E2. The X-T1 has more, unmarked, fully configurable Fn buttons. This can, and hopefully will change with a firmware update on both of the other cameras, but for now, the X-T1 wins. Firmware Ver.2.00 for the X-E2 brought with it additional customization of the AF button, the AE button, and both dedicated Fn buttons. Face Detection and how you interface with the camera (EVF, LCD plus EVF eye sensor, etc.) can now be set to the function buttons, and the AF and AE buttons are now customizable. This is a step in the right direction, but the left and right buttons on the D-pad are still inexplicably useless outside of AF point selection and menu navigation. This is my biggest beef with the X-E2. With EVF Only or EVF Only + Eye Sensor selected, image playback happens in the viewfinder too. The X-T1 has it right, so do the X100S/T, and even the older X-E1 and X-Pro1. Poor lonely X-E2. Let’s talk about camera “feel,” and all that hippy dippy stuff. The X-T1 bought with it a new level of build quality. It has a wonderfully dense and quality feel, without being too heavy. The X100 bodies have a similar density to it, but it’s actually heavier than it appears. The X-E2 on the other hand, is very light, almost weirdly so. This is perfect for traveling light, but it makes mounting heavier lenses on it feel a little unbalanced, especially with one-handed operation. I would recommend going with my Compact, Travel Prime Kit for an X-E body. The 18mm f/2 and 35mm f/1.4 in particular balance beautifully on an X-E2. The X-E2 does have a more plastic feel to it, and my experience has shown the X-E cameras are not particularly rugged (nor are they intended to be), but use it for a little while, and the feel will soon fade away once you see the kinds of photos you can make with it. The X-Pro1 feels great in the hand. It’s a good weight, good size, and the added thickness fills the hand better. It’s just wonderful to hold. I currently have my 10-24mm f/4 mounted on it and the feel is pretty much perfect. The rubber grip area on the camera is a perfect match with the new rubber zoom ring on the 10-24mm f/4. Every time I go back to this camera I get cautiously excited for what the X-Pro2 will bring. Here’s hoping the form factor doesn’t change too much. The grip situation with the X-T1 is getting a little out of hand (see what I did there?). I wrote up some impressions on the Vertical Grip in my review, and to sum up, the portrait shooter will love it. I purchased the Arca Swiss compatible Hand Grip, and now a new bigger version of the same grip known as the MHG-XT “Large” is also available. I personally find the added grip of the original uncomfortable, but what’s worse is there is a little bit of play between the camera and the grip when it’s tightly fastened, and securely mounted on my tripod. The fact that I will soon have a Really Right Stuff L-plate on order should be all that you need to know about how the Hand Grip performs as a tripod mount. I miss being able to quickly switch to portrait orientation without compromising the stability of my setup by using a drop notch. And finally, the tripod base plate will also soon be sold separately as the MHG-XT “Small.” Small is a total misnomer as the grip is non-existent, but there you have it. The bottom line is, there are lots of way to customize the grip of the X-T1 now. The older cameras started out with a different style of hand grip, the “Assist” Hand Grip. It’s lighter, quite a bit less expensive, and fastens onto your camera without the need for an allan key. It also leaves your battery and SD card inaccessible. This adds insult to injury given battery life is one of Fujifilm’s few weaknesses. An Arca Swiss compatible Metal Hand Grip is also available for X-E cameras and the X-Pro1. The same issue with quickly switching to portrait applies, but the nice thing is the same grip works on both cameras in the case of the X-E grip. Really Right Stuff go to town with optimizing their plates for specific cameras and as a result, the X-E1 L-plate doesn’t quite fit the X-E2, which is something I found out the hard way. This means I need to spend another $60 for a replacement bottom plate which would be fine if Really Right Stuff’s shipping methods weren’t so punishing to those who aren’t in the US. If you want the best Fujifilm has to offer, look no further. If you need to shoot in the rain,1 look no further. I was a bit of a tilt screen naysayer before owning the X-T1. Now I love it, and miss it when I use cameras without one. Really the only two reasons for not opting with the X-T1 are budget, or if you can’t get on with a centred viewfinder for whatever reason. Optical viewfinder zealots will tell you the electronic viewfinder doesn’t compare. They’re right that it is different, but I’d like to watch them try to see in the dark with their OVFs the way I can with the X-T1’s EVF. It’s like night vision without all the green. I like OVFs as much as the next person, but EVF-haters don’t know or are intentionally blinding themselves to what they’re missing. The X-T1 is the camera to get these days if you can afford it and don’t mind the DSLR styling. Of the three cameras, this one sees the least amount of use now that the X-T1 is here. The X-E2 just doesn’t offer enough for me to choose it over the X-T1, X-Pro1, or even the X100S. There’s no OVF, and the EVF isn’t quite as good as what’s in the X-T1.2 That said, the latest pricing of the X-E2 make it very compelling. So really, the X-E2 is for those who want the lightest, and least expensive 16MP interchangeable body possible, with a recent feature-set.3 There’s absolutely nothing wrong with wanting that, I just happen to have other options at my disposal. While the X-Pro1 still feels phenomenal in the hand, it’s age has left it with a number of missing features and inconsistencies. I really wish there was a diopter adjustment like every other higher-end X-Series camera. It’s the only camera with the Playback button placed on the right side of the body.4 Why can’t I set my image review to 0.5 seconds like I can on the X100S? Why does the EVF to OVF lever point in the opposite direction as the X100S? Speaking of the EVF, it is still perfectly usable, but its lower resolution can make things like focus peaking less useful. 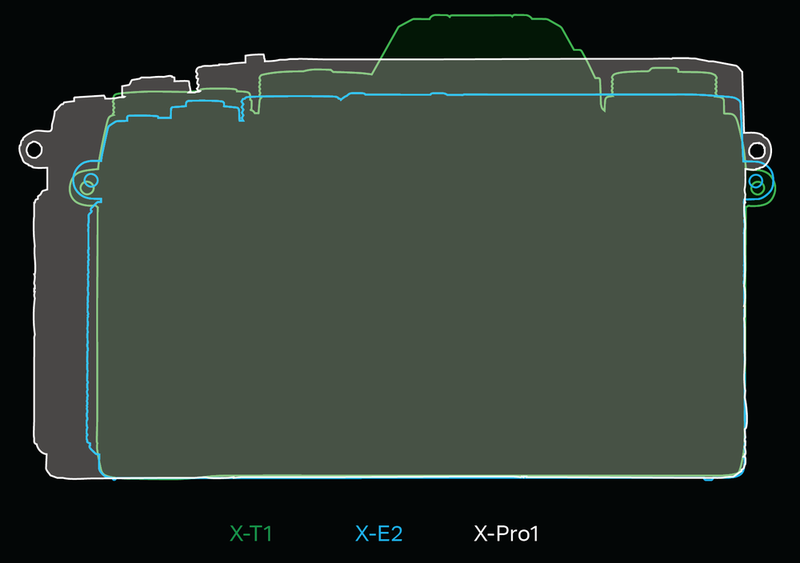 Strangely, my X-Pro1 actually has a faint electronic hissing sound when it’s powered on where every other X-Series camera I’ve used is dead silent. WiFi connectivity is something I didn’t think would matter a great deal, but as time goes on, and instances where it comes in handy occur, I miss it when it’s not available. A big draw with the X-Pro1 is its optical viewfinder. X100S owners will feel right at home with the X-Pro1’s OVF, and it even includes the added nicety of being able to zoom in or out by holding the EVF/OVF lever down few seconds. This can come in handy when you want a lot of space around your frame for more time to see what’s entering it, or you’d prefer to have the frame fill as much of the viewfinder as possible. The OVF does come with some caveats, however. The zoom feature results in some of your frame falling outside of the OVF with lenses only as wide as the 23mm f/1.4. 10-24mm f/4 owners will want to forego the OVF entirely for anything wider than 18mm. A full half of the lens’s range results in framing that falls beyond what the OVF can display. Not to mention that a good 20% of your frame is totally obstructed by the lens. Stick to the smaller primes though, and the OVF is fantastic. These quibbles aside, the X-Pro1 is still a remarkably capable camera. There’s a reason the X-Trans sensor5 hasn’t changed. It delivers superb images. And let’s face it, if you want a Fuji camera with interchangeable lenses and an OVF, it’s the only game in town. If this was the X-Pro1 as it was released in 2012, I’d recommend staying away, but Fujifilm are constantly improving the camera via firmware updates. It simply is not the same camera anymore and because of that, it’s a viable option and can be had for an excellent price these days. Don’t miss my comprehensive handling review of the Fujifilm X-T1. If you’d like to purchase one of these cameras, or anything for that matter, please consider using one of the affiliate links below. The price is the same for you, but a small percentage of the purchase price goes to me, which helps keep this site going. Thank you.